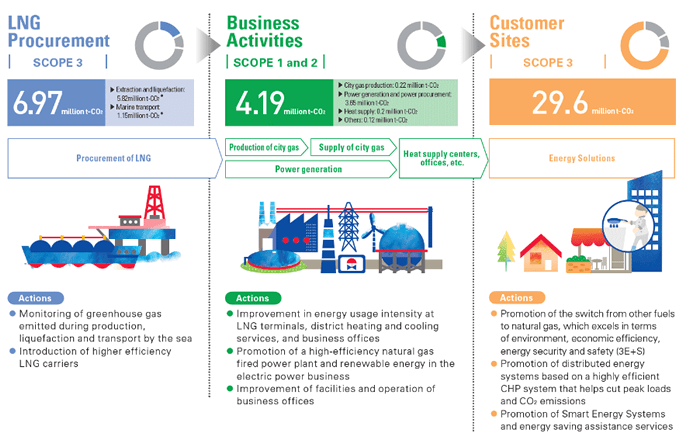 The Tokyo Gas Group determined that addressing climate change is a material issue, due to our responsibility as an energy company. We have set the Guidelines for Global Warming Countermeasures, which have concrete numerical targets, not only for our business operations but also for customer sites where CO2 emissions are highest. In light of the Paris Agreement adopted at the COP21 conference as well as movements against climate change in Japan, we have been actively pursuing low-carbon initiatives. These include implementing a wider use of natural gas, which has a lower CO2 emission factor, developing and expanding Smart Energy Networks (SENs) that combined heat and power (CHP) systems* and other highly efficient equipment with advanced energy management and embracing digitization technologies and innovation. In our electric power business, we will develop an optimal power source portfolio with eco-friendly natural gas-fired power plants, renewable energy and so on. Furthermore, in our overseas business we will deploy technologies that excel in reducing CO2 emissions and energy consumption across our LNG value chain as a contribution to global efforts to address climate change. SCOPE1: Business’s own direct emissions of greenhouse gases. SCOPE2: Indirect emissions from consumption of electricity, heat, and steam supplied by others. SCOPE3: Indirect emissions other than covered in SCOPE2 (emissions by other parties involved with business’s activities). Greenhouse gases are released not only when fossil fuels are burned but also when they are extracted, processed and transported. Therefore, it is important to take into account emissions throughout the fossil fuel lifecycle. From the lifecycle perspective, natural gas generates the lowest CO2 emissions of any fossil fuel.